Picasa Web Albums offers more free storage if you are a Google+ user. According to Picasa Web's help center, "photos up to 2048 x 2048 pixels and videos up to 15 minutes won't count towards your free storage". If you upload photos from Google+, they're automatically resized to 2048 pixels on their longest edge, so they don't use the 1 GB of free storage that's available in Picasa Web Albums. Most people can't use Google+ because it's invitation-only, so the current rules still apply to them: only the photos up to 800 x 800 won't count towards their free storage quota. Like Google Buzz, Google+ uses Picasa Web Albums to store photos. You can upload photos from the Google+ interface and even automatically upload the photos taken with your Android phone. Google+ lets you add captions and name tags to your photos, rotate them and apply different filters using the built-in image editor. Now your friends can tag your photos and you'll receive a notification when someone tags you in a photo. The downside is that "tagging a person in one of your photos in Picasa Web Albums or Google+ will share the album with the person tagged". only if i could get a google+ invite... anybody got one? Even with an Invite you won't be able to use it if you can't create a Google Profile. So that's Google Apps users out. I don't think it is a good idea to let a contact of a contact be able to share my photo album to complete strangers just because I tagged someone. I'd like to tag my pics but I also want to control who sees them.
" 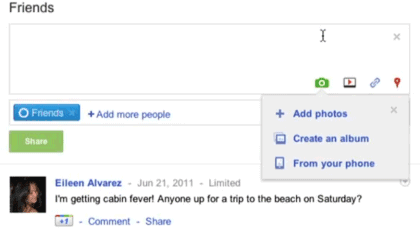 Now your friends can tag your photos and you'll receive a notification when someone tags you in a photo. The downside is that "tagging a person in one of your photos in Picasa Web Albums or Google+ will share the album with the person tagged". You will probably be able to disable that in privacy settings, so wouldn't worry about that. This is great news. To make the most use of this, it would be great to take 1:1 aspect ratio pictures out of the camera. Does anyone know of an app similar to multi-aspect cam for Android? There unlimited invites, what I mean by that is that if you add a contact to a Google+ circle they will be sent an email which will contain an invite button. There also a invite button in Google+ but that disappears and reappears randomly. The only limit is that Google is turning off and on the invite system and the sign up page to control demand and traffic, I guesting even Google servers have limits on how much demand they can take. I suspect the positive marketing buzz about the service has meant they are rolling out the service quicker than original planned as well. When it first launch they said invites would be sent out in a few weeks that seem to have change now and invites are being sent out is great numbers now. A good way to get people to use Google+ and presumably switch from that other service (what's it called again?) is to give them things like extra storage. It would be brilliant if they could find a way to port all your "friends" from facebook to the new service. Does anyone know why in Google+ photos missing view count.